CrossFit day on the mountain (round 2)! 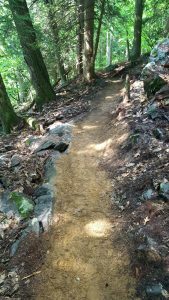 The new Mahanna Cobble Trail is planned to be completed this year! Sections of the new trail need a thick layer of soil for a sustainable walking tread. Join the seasonal BNRC trail crew on the mountain to help move this project forward. We say CrossFit on the mountain, because it will be a digging and hauling soil kind of day. The hike up to the work site will be a moderate climb. BNRC will provide all tools and gloves.